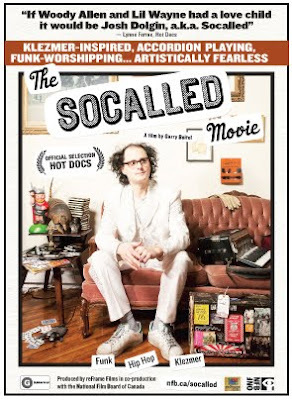 The "Socalled" Movie, about my buddy Josh "Socalled" Dolgin, is now playing at CinemaSpace, the friendly hemp-seat movie theatre at Montreal's Segal Centre for Performing Arts. This is an excellent and most inspiring new documentary film produced by reFrame films and the National Film Board of Canada. It was directed by Garry Beitel ("Chez Schwartz", Bonjour Shalom", etc...) and produced by Barry Lazar and Ravida Din. I hope to see all you Socalled fans there. June 5-8 & 10, 2010 at 7pm. Tix at 514-739-7944. Bonus: Free bottle of Dr. Bronner's organic hemp soap and pack of Manitoba Harvest hemp seeds to all who ask for it at the shows! Thanks to the CinemaSpace sponsors. Lots more info on the film HERE.